Bajoran terrorist leader. Has an intense hatred for Cardassians as a result of being tortured while in captivity. Speaks with the use of a voice-synthesizer. Opposing personnels STRENGTH -1 where present. 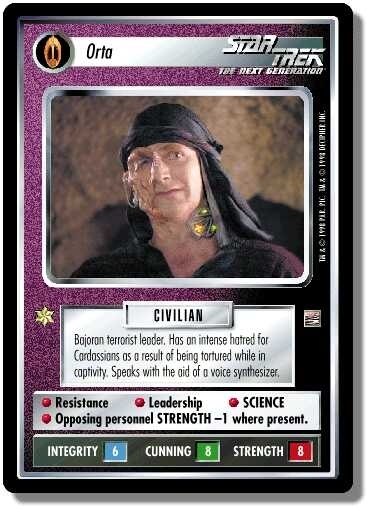 Characteristics: "Continuing Mission"-related cards, affiliation, Resistance, Bajoran species. There are 15 entries for Orta (ST1E 6 U 67) at the Tradeplace (50 haves and 2 wants). Click here to see all trade list entries for this Uncommon card!